This is a book that I have heard floating around literary circles for years and always had a passing interest in reading at some point. It wasn’t until I saw the Netflix movie adaptation of it recently, though, that I actually decided to get it. I highly recommend the movie, as well! It is a different take on the novel, while still keeping the most important elements of the book alive. The characters have a bit more distinction and personality in the movie I think and, if you are looking for more of the romantic aspect, the movie is definitely better in that regard. The book is written completely in the form of letters, with just a few journal entries, as well, which I found to be very interesting! I have hardly read any books in this format, but I think that Shaffer and Barrows did a really good job with it. Despite the whole thing being inherently past tense, because we as a reader had to wait until after the action happened to read about it, I never felt like we were missing anything too vital. The only thing that struggled a little bit here was (spoiler!) the romance between the main protagonist Juliet and Dawsey. Because there were not a ton of letters between Juliet and Dawsey, and because we never really got to see them interact in real time, I did not feel the romance quite so keenly as I would have in a different format. This is why the movie does a better job handling that aspect, in my opinion. However, this did not detract from my enjoyment of the novel, because it never felt like a simple romance to me anyway. It was sweet to get the hints of Juliet and Dawsey’s growing affection, but that was never the central focus of the novel. I was so much more invested in learning about Guernsey and the stories of the inhabitants there. 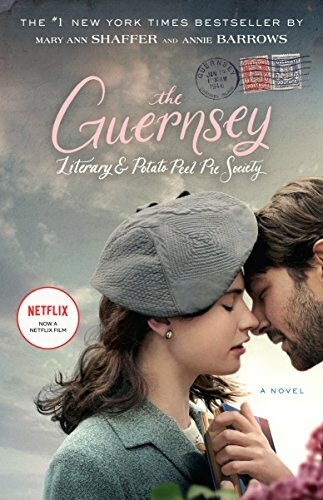 Although Guernsey is a fictional story and the characters are made up, it sheds light on the very real event of the German occupation of the Channel Islands. WWII never fails to interest me and I was so excited to see that the book focused a lot more on the history and events of the war than the movie did. It had the space and time to give more detailed accounts of the events and tie in more characters from the island. I loved how each letter from the different characters offered a different perspective or piece of the overall history. Shaffer and Barrows really did a great job juggling all of the different perspectives that were presented, in a way that gave the reader an extremely well rounded picture. The voices of some of the minor characters kind of blurred together, but that was not much an issue. I also loved that in the book, more so than in the movie, it came across as a love story between the characters, the authors, and the reader and literature in general. There were so many lines crafted about love and care for books, reading, bookstores, and writing. No one that wasn’t in love with literature would write such things. It was nice to see examples in the stories about how books brought people together or gave the characters hope or comfort in troubling times. The characters each had different reading preferences that changed with their personalities and the things they were facing at the time, and I loved the nod to so many other great authors: Charles Lamb, the Bronte sisters, Wilfred Owen, Jane Austen, Sophocles, etc. It truly is a book written for people that love books. The writing itself is also fantastic! The actual structure and mechanics are all pretty normal, but again, being written in nothing but letter format, this is impressive. It gives the tone a sense of stark honesty, a personal quality, that is very fitting for the subject matter. Many parts of it were quite moving. Juliet and her editor Sidney, were very funny too! Their letters were rich with humor, sarcasm, good-natured jabs, and genuine warmth. It made reading them feel very relatable. Well I, for one, could have done without the letter concerning the animals!